Watch FFL's videos on YouTube! Feminists for Life’s Revolutionary Work Changes Hearts, Lives, and Campuses — One at a Time! October 29, 2013 – FFL President Serrin Foster’s explains pro-life feminism during an interview on the Gist with CatholicTV based in Watertown, MA. • FFL President Serrin Foster explains the mission, goals, objectives and accomplishments. 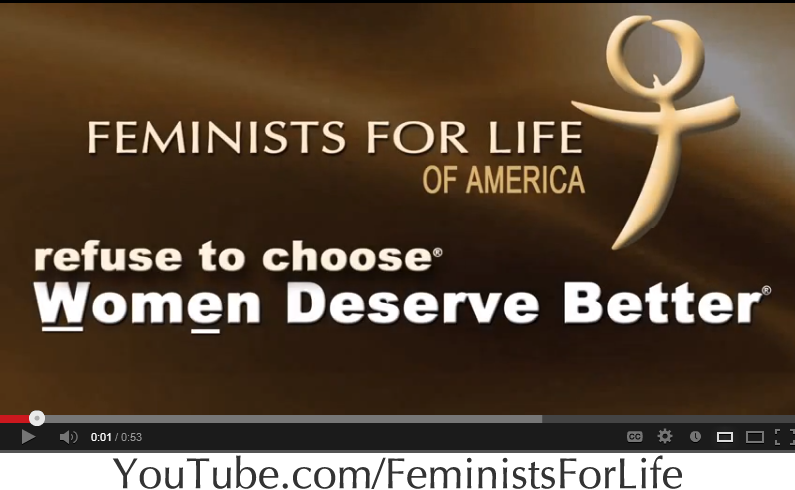 • Feminists for Life answers Roe attorney. • FFL Speaker Joyce McCauley-Benner shares her personal “Victory Over Violence” after being raped while working her way through college. • Revolutionize your campus with resources and support for pregnant and parenting students. • Chaunie Brusie’s personal story as a pro-life activist who learns she is facing an unplanned pregnancy. • Chaunie Saelens Brusie learned she was pregnant while in college – and a pro-life activist. • Joyce McCauley-Benner was raped, then learned she was pregnant. • Melissa Ohden was aborted – and survived. • July 17, 2013 – Hear FFL President Serrin Foster on NPR discussing late-term abortions — and refocusing the contentious debate on the unmet needs of women. Emmy-winner Michel Martin hosts. • January 22, 2010 – Feminists for Life President Serrin M. Foster was interviewed on National Public Radio’s “Tell Me More with Michel Martin” alongside partial-birth abortion practitioner LeRoy Carhart.